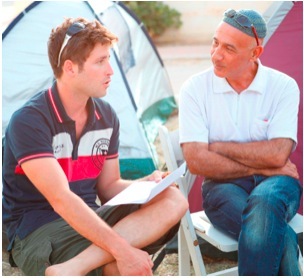 Haim Bar Yaakov (right) discusses housing problems with a fellow activist. Each time the sirens blare, Haim Bar Yaakov rounds up his children in their Beer Sheva apartment and ushers them into the stairwell. He said, "I wouldn't take them down to the public shelters, they are poorly maintained and anyway I doubt we would get there in time." It has been a tense week for Bar Yaakov as rockets from Gaza rain down on Southern Israel. The 53 year-old founder of NIF grantee Life With Dignity, which seeks housing solutions for disadvantaged Israelis faced with eviction for mortgage default on non-payment of rent to public housing companies, has spent more time with his family. His oldest son Eran is serving in the IDF away from the Negev but his younger three children have all been at home with the schools closed during the violence. He said, "The children are very tense. I only realized how much when I took them on a day trip to Tel Aviv on Monday. I suddenly felt them relax. It was like we had traveled to another country." Bar Yaakov's ex-wife Irit has also had to take time off her work as a taxi driver to help look after the children. On Wednesday, after an uncertain ceasefire got the region back on a more normal footing, Bar Yaakov found himself in the Beer Sheva court with a disabled single mother who has children aged 6 and 2, and is fighting an eviction order from the Amidar government housing company. "She told me that every cloud has a silver lining," he explained. "She said that while the rockets were falling she was scared her apartment would be hit but also relieved that during the emergency situation, the police had suspended eviction activities." Since founding Life With Dignity, Bar Yaakov has found housing solutions for 150 families, and helped hundreds more. He said, "But I think more important than that we have raised awareness of the heartlessness of the banks and public housing companies and built a national network of organizations and activists." He said, "This has been a week when in the face of rocket attacks I have been called upon to protect my own three young children Efrat, Rachel and Nehoray as well as the dozens of other families facing eviction who need physical and extra emotional support during these dangerous times."